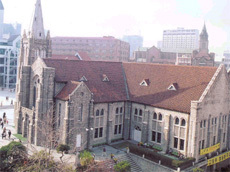 If you are Christian, particularly Presbyterian, there is a good local church in downtown Seoul. You might call it a "Home Away from Home." It is the Youngnak Presbyterian Church's International Worship in English (IWE) which caters to the needs of local and foreign worshippers of God. Situated in downtown Seoul near Chungbu Police Station Youngnak's IWE ministry (pronounced I WE) offers English services three times a week: Sunday at 10 a.m. in the Service Building Room 504, also at 3 p.m. in the Mission Chapel. On Wednesday the service starts at 8 p.m. in the Mission Chapel. There are five Bibles studies taught in English at the church. Yongnak's IWE has a web site where weekly internet TV broadcasts of the 3 p.m. worship can be seen. On average, over 200 people attend both services on Sunday. All the services are officiated by Rev. 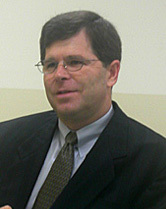 Bill Majors, as the head pastor from America. 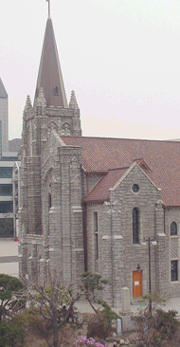 English-language choirs are involved in each IWE service at this prestigious Youngnak Church which was founded in 1945. 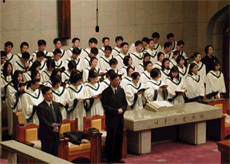 On Dec. 21, 2003 there will be a Christmas Cantata given by the joint choirs of four worship services. Two choirs will be from IWE and the others from Eighth U.S. Army's South Post Chapel services. The first Cantata will be at the South Post Chapel at 10 a.m. and the second one will be at Youngnak's Mission Chapel at 3 p.m.
Also, a special Christmas Worship will be held at 3 p.m. on Dec. 25 in the Mission Chapel. Dancing, gifts of money, food, and clothing will be offered to the high school students from various orphanages as parts of the Christmas celebration. Also scheduled for the needy students is a special four-day "Love Camp." Pastor Bill (Majors) has been involved in the camp for orphans for the last 18 years. Pastor Bill (Majors) is fluent in both Korean and English. He came to Korea fresh out of college to do the work of God in a country he always dreamed about serving in. He is realizing his life-time goal of serving God in Korea. The Seoul Times reporter Ms. Park Jin Hee recently met with him in his church office. Here are some of the questions and answers. Q: What do you think about the English services in Korean churches? A: It's very popular. It's like almost all the large churches have an English service, and the smaller churches would like to do so. The question they have is how we start an English service and how we can draw people into the church. I mean people who do not speak Korean. Of course, some Koreans attend English services to only practice their English. Q: All worshippers of your service come from various countries, I presume. I guess you should have some difficulties in the service? A: No, I don't think so. People, who speak English as their second language, have been to church before. So they understand how to worship from the experiences they bring with them from their home country. Our worship is very similar, and for the most part it doesn't require a language. It just requires some experience in church, so I don't see any problems. Basically, it's hard to say you cannot come to the church because you don't speak English well enough. Isn't it the nature of church? The church is supposed to welcome everybody regardless of who they are, or what their skills, talents, abilities, or lack of abilities. However, in the children's ministry we find that language requires communication and children are so hard to communicate with, so it requires a little level of ability, or experience to allow the children to come to the IWE children's program. Therefore we ask the Korean children who have not lived overseas to join a different program called Children's English Program Class (CEPC). There are over 200 children who attend that class. Q: What brought you to Korea? A: When I was in junior high school, I really felt like God called me to be a missionary. I didn't know what country and I didn't really know the definition of what it meant to be a missionary. Being a missionary is kind of like being an engineer. There are numerous careers available for you as an engineer. That is true for becoming a missionary too. I went to college and majored in missions, and during college I met a Korean from Suwon, and we became friends. He introduced his country to me which made Korea more of an opportunity, an open door for me to visit. And I wanted to go overseas so bad that I made plans to visit Korea as soon as I finished school. But I wanted to make a life commitment. If Korea is the place that God wanted me to stay then I was ready. That's why I came here with a one-way ticket even though I didn't know how long I would stay here. Q: Would it be all right if I ask you about your family? A: Well, I came here as a bachelor. It was my Korean friend from Suwon who introduced me to a group of girls who had just graduated from high school and I had just graduated from college. The girls were visiting my friend's house one evening and I was there too. That's how we got introduced. I had been in Korea for only two months. Five years later I proposed to one of those girls and we got married Halloween Day, 1987. Now we have two daughters who are in middle school. Q: Your Korean is immaculate. How have you mastered your Korean? A: For 21 years of my stay in Korea I've seen five different Korean presidents and I have translated for each one of them. There is a National Prayer Breakfast, once a year, meeting at a large hotel in Seoul. I've been asked to translate for most of them during the last 15 years. Occasionally I've translated and served as a bridge between the Korean society and various international communities including the U.S. Army's community. I've learned Korean by osmosis. When I came to Korea in 1982, I met a lot of Korean students who wanted to learn English from me. However, I wanted to learn their language more than they wanted to learn my language. But I needed to find a way to avoid their aggressive approach to have me speak English with them. So, I tried many things. People asked, "Where are you from?" I would say "Dokil-eso Wattsomnida(독일에서 왔습니다)" in Korean. That, of course, means "I came from Germany." I thought nobody would want to learn English from someone who came from Germany. And initially that helped a lot. So, they would speak Korean with me. Until one day one college student who had majored in German. Hearing I was from Germany he started speaking to me in German. Of course, I can't speak any German so I realized that my strategy had to be trashed. Instead, I chose to go to other places including the market place. In market there were many Ajummas(아줌마들) and Ajossis(아저씨들) who had given up on learning English. They had no desire to practice English with me, but I was able to practice my Korean with them. They were perfect partners. I also visited an orphanage in Uijongbu, a suburban city north of Seoul. At that orphanage I found my place and my family. I lived there as a resident missionary with 80 some children and 15 or so staff for four years. I had gone to Yonsei University for it's Korean Language Program which prepared me for the four years in the orphanage, but my fluency really came out of my experience in living with those children in the orphanage. My Korean wife has been very helpful to show me even more things important in the Korean culture and language. Q: What's your major impression of Korea? A: I've never met this kind of people before. As American, we've got this expression "I know this may hurt you, but I have to tell you." However, in Korea, there is this thing people call "Kibun(기분)." They are always careful of saying something that could hurt people's feelings even though it may be true. Q: How many foreigners come to the IWE service and what are their nationalities? A: Many people ask me that question. Your question is a great question, but I don't think that is an appropriate question in today's world. I was born in America, but I've been living in Korea, and I feel very comfortable in the Korean culture. Please let me ask you a question. I've got two children. They were both born in Korea, grew up in Korea, and their mother is Korean but I'm (their father) an American. Do you call them Korean or American? They are both or neither. But you can't say they are only American. Korean people tell me that I'm Korean and then we laugh at how my looks keep me from ever being fully Korean. That's what I mean. There are plenty of people like my children in our church. There are also many Korean people who grew up in other countries and they struggle with the Korean language and culture. They struggle here more than I do, but they are Korean. Q: Do you have any fellowship programs for the worshippers or do you have any partnership programs with other churches offering English services? A: Yes. We have joint services with other churches including Shin-il Church in Yaksu-dong. We have a Christmas Cantata, Dec. 21 in the Mission Chapel as a joint choir with the Eighth U.S. Army's South Post Chapel Worships. Our two choirs will join their service on that same day at the South Post Chapel. We are looking to invite people who are not involved in worship or social service to come and see what opportunities are available with us.